This approach enables customers to take advantage of a “single data sheet input source” for both automation and verification between the mechanical and electrical models. Consistency and verification insures a complete and validated set of engineering models for both the electrical and mechanical engineers. With the industry-standard STEP format and schematic symbols, and PCB footprints exported in multiple EDA formats, customers will realize the competitive advantage of EDABuilder, which supports the wide range of customer owned CAD system exports. PCB footprint automation is supported across the full range of component families including 100% of surface mount parts defined in IPC-7351 as well as commonly used through-hole parts, and all have 3D model generation capabilities. The process, driven by rules, settings, and form entered component dimensioning, accurately builds both PCB footprints and the 3D STEP models in a consistent and repetitive process. Users enter via the forms the PCB component dimensioning using the IPC-7351 or recommended manufacturer dimensioning. The mechanical dimensioning is entered on the same forms and displayed on both the front and side mechanical views. Mapping and scaling is performed automatically based on the component type to an embedded 3D template. Using this template technology, fine levels of granularity and details are achieved. The 3D STEP models can be imported directly into the mechanical design tools, where additional details, graphics, or corporate styles may be applied. They may also be exported directly into Cadence® Allegro® and OrCAD® PCB Editors with origins, offsets, and alignments automatically assigned. EDABuilder 3.0 includes a number of other enhancements including the ability to import symbol and footprint libraries from a number of popular schematic and PCB editing tools. 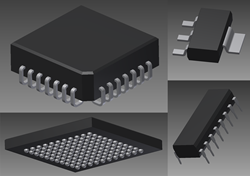 This allows comparison between a schematic symbol and a PCB footprint to verify consistency between the components. Making these comparisons ahead of time helps engineers and designers find library problems earlier in the design process, reducing change costs and time. For more information about EMA and EDABuilder 3.0, visit EMA at ema-eda.com/EDABuilder3 or call 800-813-7494. EDABuilder 3.0 will be available in October starting at $ 2,950, which includes one year of maintenance. Since 3D STEP modeling is bundled with the existing product, all EDABuilder customers currently on maintenance will automatically receive this capability. EMA Design Automation is a leader in product development solutions offering a complete range of electrical and mechanical CAD tools, product lifecycle management systems, services, training, and technical support. EMA is a Cadence® Channel Partner serving all of North America, an Autodesk Authorized Value Added Reseller, and is an Authorized North American Distributor of Aldec® Active-HDL™. EMA manufactures EDABuilder®, the Component Information Portal™ (CIP), TimingDesigner®, and CircuitSpace®, and all are distributed through a worldwide network of value added resellers. EMA is a privately held corporation headquartered in Rochester, New York. Visit EMA at ema-eda.com for more information. Component Information Portal is a trademark of EMA Design Automation, Inc.
Aldec and Active-HDL are registered trademarks of Aldec, Inc.